During the Hangout, Wes explains how to adjust bids for mobile devices. He does an account walk through, demonstrating how to adjust bids for the time of day, location and device. For example, if a user is on a mobile device near your store during regular business hours, it may make sense to increase the bid. Wes explains how to calculate the actual bids when using multiple bid adjustments at the same time. Andy then explains how to create mobile preferred ad texts and mobile preferred ad extensions. He emphasizes the importance of sending users on mobile devices to optimized mobile websites, and briefly touches upon ValueTrack parameters. This blog post further explains how to use ValueTrack parameters to manage URLs by device. And remember to tune in to the live stream of our next Hangout on Air at 11 a.m. PDT, Thursday May 9th, when our specialists discuss the ad approvals process in detail. Posted by the Adwords team. On April 25th, AdWords Specialists hosted a Hangout on Air as the last installment of the Enhanced Campaigns Hangouts on Air series. "Every business is different, and there's no one size fits all for AdWords campaigns. Think about what your customers are looking for and what actions they might want to take, and craft your ads with the right features and extensions to be most relevant." Learn more about enhancing your ads with different types of extensions. See how your site looks in mobile and give it a mobile makeover. "People on the go are often looking for something local - be it a business in the area, directions, or a phone number. Offer your customers more ways to easily communicate with you, whether that’s through your website, via phone with call extensions, or with location extensions to bring them into your physical location." Find out how to set up location extensions. 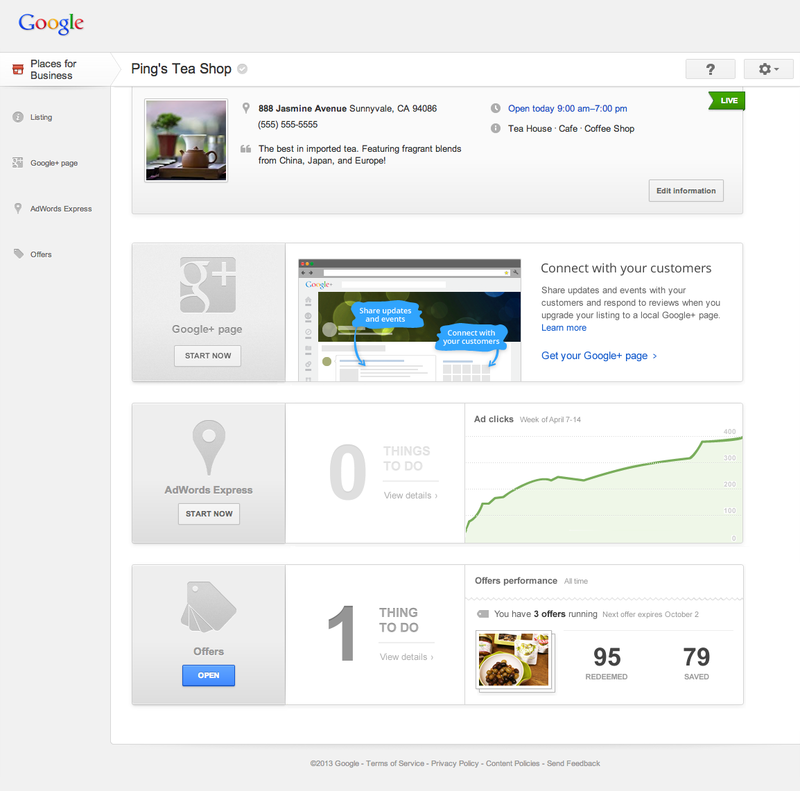 “In order to reach potential customers, SMB’s need to increase their online visibility. 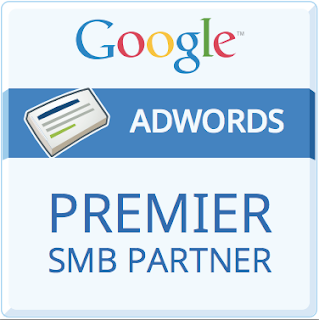 Google AdWords campaigns enable businesses to derive tangible value from their online marketing efforts." Learn how AdWords Premier SMB Partners can help you maximize your AdWords potential. We’re always looking for ways to share helpful tips with our readers, so we asked a few of the recent winners of our 2012 Premier SMB Partner Awards to share some words of wisdom with small businesses for digital success. that will roll out to business owners over the coming weeks. The upgraded interface is simpler and more intuitive, so the process of updating your business information is quick and easy. There’s also a widget that helps you understand at a glance how much more you need to do to complete your business profile. When you make changes to your business, your customers want to know about it right away. Most edits made via the upgraded user interface now appear on Google Maps and our suite of other services within 48 hours. As before, we may continue to moderate changes to ensure the highest quality local experience. Through this upgraded interface, you will be able to access your local Google+ page to take advantage of social features like sharing photos, videos, or posts. For businesses who also use AdWords Express and Google Offers, managing your ads and promotions is easier than ever. 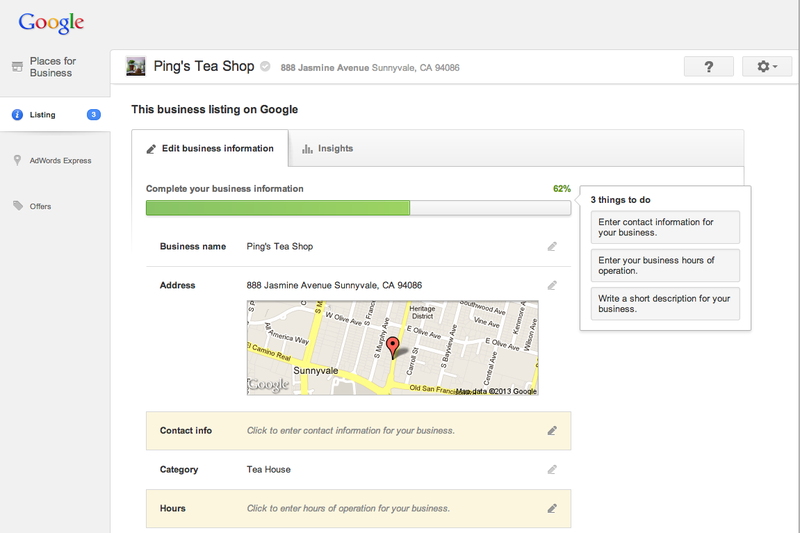 You can check results and make edits directly from your upgraded Places for Business dashboard. If you’re an existing user of Google Places for Business, this new interface is coming soon. You’ll receive an email notification once we’ve upgraded your account, and see the new interface once you sign in as usual. If you haven’t yet verified your business listing, now is the time to do it! Hundreds of millions of people around the world use Google Search, Maps, Mobile and Google+ to find and discover great local businesses -- either in their hometown or in the places they’re headed. We’ve been able to deliver more comprehensive, accurate and up-to-date information to help these people find what they’re looking for thanks to you, the many business owners who manage your online presence through Google Places for Business. Today, we’re introducing an upgrade to the look and feel of Google Places for Business that will roll out to business owners over the coming weeks.